Thomas Barlow and Barlow & Co.
Nathan Perkins Vs. Turnpike Co. I hope you enjoy learning some of Maple Shade's history. New page about the corner where the Custard Stand is. The house next door was never the toll gate house. The Custard Stand lot is where a toll house was. Note- More info added on March 1. BTW- This is the page which starting me getting into getting more toll gates information. On February 22, I went to the Burlington County Clerk's Office in Mt. Holly and got the title chain for it. Now added. All the streets info and maps download links have been moved. See the sidebar index. In the 1800s NJ School Reports only one holiday is mentioned- Arbor Day. You did not have off but went to school and sang songs and heard talks and then planted a tree somewhere on the school grounds. I think they knew back then something we do not realize as much now. How important trees are! WETS MAKING FIGHT AT MAPLE SHADE, N.J.
With the election less than a week off, when the residents of Chester township will vote on local option, the dry advocates have awakened to the fact that the saloon element that was supposed to have abandoned the fight has been hard at work in Maple Shade. Residents of that town are being lined up in hope that the local option advocates in Moorestown, feeling secure in their strength, would be caught napping and be outvoted by the residents of Maple Shade. The anti- saloon men and women of Moorestown who have been idle are now making big effort to arouse the town to the dangers of the situation. It is generally believed that the local optionists will win. If Moorestown was a borough it would be found that nine tenths of the voters are against the saloon, but the town is a part of Chester township. The election will be on next Tuesday. 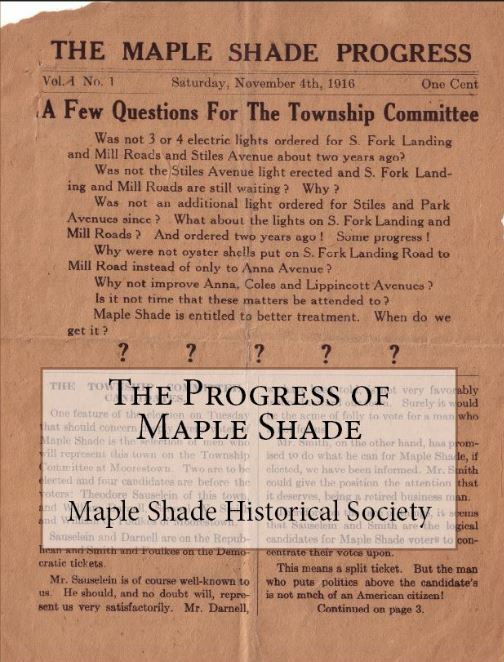 The outcome of that election is in the book "The Progress of Maple Shade." Years ago when Joe Laufer, the official Burlington County historian, was alive, he had meet ups with the Historical Societies and local historians and history lovers. He was very much involved in the restoration of Smithville Mansion as that's natural as he lived in Smithville. He got started in history after moving to New Jersey and he noticed the area had many Quaker Meeting Houses so he photographed them. A emphasis of his was "NJ historic tourism." Have you ever gone on vacation to a family member's home out of this area and had time you wanted to get the most out of and so you said, "What is there to see around here?" You then went to some local historical place and you LEARNED THINGS and enjoyed the visit. Perhaps the surprising thing is many locals who lived there for years perhaps never bothered to go to the place you visited. To see 1700s houses there is the Burlington County Historical Society, the Griffith Morgan and Burrough Dover houses in Pennsauken, Moorestown Historical Society, Camden County Historical Society, and others. We have variety- the Air Victory Museum in Lumberton, Kirby's Mill in Medford, Burlington County Farm Fair, Burlington County Prison built in 1811 in Mt. Holly, and don't forget Maple Shade Historical Society's Chesterford Schoolhouse. I know I am leaving a lot out. I would think that about every town has somewhere to visit. If you are interested in buying a copy or want to know more about the book then scroll to this webpage's bottom. In the making of the book of the scans of the 1916 and 1917 Maple Shade Progress newspapers I have one regret in that in the indroduction I did not state that the scans (or images) in the 8.5 by 11 inch book are actual size. That is exactly how big the original newspapers were! The first ones measured like 7.5 by 10 or something which let it work out well with the needed book margins. The size you see in the book is the size the papers were. He and Catherine Sixberry won Township committee positions. Arthur Cutler said that Barlow & Company was started by Thomas Barlow Sr. and his sons Thomas and Frederick and adopted son Edwin D'Ancona who was a salesman. A earlier census for the Barlow family listed him as living with them at Main Street and Holly Ave. and as having been "taken in." Arthur Cutler also said that Edwin D'Ancona and his wife opened The Sweet Shoppe at about 113 E. Main Street. It was a favorite spot of children and adults alike. A 1916 or 1917 Progress has Edwin leaving the Childs' Store in Maple Shade to work for the new Acme in Moorestown and states something like "He ought to know sales." I saw later Progress articles where he was the Mayor of Maple Shade and some where he worked for Barlow & Company. He seemed to be in and out of working at Barlow & Co. Anyhow he would probably best be remembered for being involved in politics. No. 1- Maple Shade. Located on Camden Pike, in Maple Shade. Anna M. Grady, teacher. Pupils enrolled, 25. No. 7- West Moorestown (colored school). No. 8- Moorestown High School. I don't know everything involved but I looked in the book "Moorestown and her Neighbors" by George DeCou and it states that in 1917 the Chester Brick Schoolhouse was sold to Joseph Matlack where it stayed on the farm and was later used in the summers to house berry pickers. 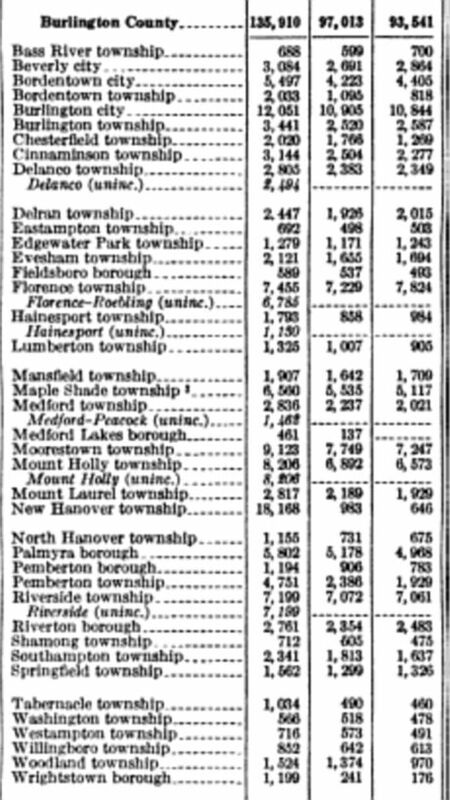 You see after Moorestown separated they were stuck with schools like "Schools No 5, 6, 7" etc... and we had Schools 1 and 2, so we just continued on with 3 on Mill Road, and 4 on N. Forklanding Rd. The Chesterford School was at the opposite end of the spectrum before the "Township School Act" of 1894 changed the district numbers from county to townships. It was then "School No. 27." Advantages of living at "Maple Shade"
Fourteen Trains each way daily. Pure water at 16 feet. The Properties are absolutely sure of increase in value. Sold for Cash or on Installments. No rent Days. Well before the Cutler Agency took over this in about 1906 you could practically count the houses built there on one hand! The train wasn't enough to suburbanize Maple Shade. Or bring industry as some have eluded. A brickyard was already going since the mid 1800s. If we jump way ahead of ourselves, you might say the Benjamin Franklin Bridge (previously the Delaware River Bridge) which opened in 1926 (You can always remember because it was the Sesquicentennial.) was the most powerful factor. Maybe in the Post WW2 housing boom but not earlier. Here is a segment from a 1920 Maple Shade census showing presumably as employers- the New York Shipyard, Victor Talking Machine, and the Campbell Soup Company. This collection of old movies of Maple Shade, NJ aired on the Maple Shade Cable TV network. This has been copied from a VHS tape and is not the best quality, but I am not sure how good it got. The beginning and end photos of the Roxy have been added. Do yourself a favor and open the video up in Youtube- Maple Shade, NJ in the 30s and the 40s That way in the Description you can see the contents and time stamp links. Not to defend Ernest Nichols, who owned Mary's Cafe, but I think this would have been common around here and Martin Luther King being from somewhere else didn't expect it in a northern state like New Jersey. Willingboro got notoriety by their anti black happenings and the Twp. now being predominantly black. Maple Shade developers spelled out their "policy" earlier on. And Maple Shade was basically almost an all white township until Kings Highway Towers apartments and Spring Hill Apartments let blacks in near the early 70s. When the Ku Klux Klan made a come back in the 1920s and 30s. Maple Shade's chapter had a parade and later a cross burning in 1926. The site marked a little down the hill from Pine Ave (cross burning was on hill) is now the "Southern Cross Apartments." Please note that while some people liked the KKK, most people grew very sick of it and it really lost a vote of popularity to say. There was even a meeting where Maple Shaders were going to throw stones at the KKK members! I talked to a lady who grew up in Maple Shade working first at her Aunt's newspaper store. She said ALL, repeat ALL of the realtors came in their store and said, "If any black people ever come in here asking if there are homes available in Maple Shade, tell them that there are none." Anyhow, Happy Martin Luther King Day and a thank you to all those responsible for the marker put in this past year at East Main Street and Route 73, Maple Shade, NJ. Special thanks to the Maple Shade Township Council who placed the marker. Mary's Cafe was lastly the Moorestown Pub. and pretty much tells a story in itself. at the Chesterford Schoolhouse on West Main Street, Maple Shade. I joined Newspapers.com one week free trial and over about 30 plus hours got these images. If you have a fast internet connection download the "NewspaperClips" folder. Save the whole thing if you want a "Maple Shade historical library of readings!" Read the ReadMe file in the folder. You will learn a great scope of knowledge concerning Maple Shade! When I was a member of newspapers.com for the one week free trial. besides screen captures etc... I got- I left a "mark" there which anyone can access "clippings" and view/download them without a membership. I have included them in the above OneDrive folder link, but here is the newspapers.com web page. Thomas J.S. Barlow, the president of the Maple Heights Land Company, formed Barlow and Company in 1912. Soon after, Camden attorney John F. Harned bought the Levi Lippincott farm then owned by Henry T. and Emma E. Bleam. It became the Plan for "The Orchards" containing One Acre Farm lots for Barlow and Company. Old timers today remember pear trees at the right side of South Lippincott Ave. near Main Street. They might have been part of the original 3,000 fruit trees. 1925 Trolley Wreck- It smashed into the Sealect Seafood- Alden Cafe (before the fire and rebuild) building. Here is a link to the full article- 1925 Trolley Wreck at den's OneDrive NewspaperClips folder Also have a picture.png and a PDF version in the folder as well. From the Maple Shade Progress July 5, 1973. Nice Tribute, but William F. Brown founded the Progress in 1916. Barlow & Company ordered their lumber for their bungalows through John S. Collins and Son Lumber co. which had several locations. Their main yard was in Moorestown but they had one in Maple Shade as well. Do yourself a favor and click FILE, SAVE PAGE AS at your left top corner of your web browser thereby saving the PDF file which will take a minute or two to load as it is 14 MB! When it is a saved PDF the magnifying glass or SEARCH will let you find instances of things say for example "Maple Shade" quickly. Great read as it tells of the times back when post offices started there was not even a concept of a telephone. This is how important they were! Also it says Stiles Corner (or Corners) for Maple Shade's earlier name. Email me with your phone number or call me and we'll make an arrangement for you to get a copy. The Maple Shade Historical Society makes more money off of direct sales. Originally a double house, built about 1863. Read the Brickyards page for more info. This house is highly historical and should be preserved and revered in that manner! Compare Maple Shade esp. to 1930 and see how early we turned mostly suburban! Be sure to think of the land area sizes of each of the Twps. as well!